$10 oil: Crazy or the real floor beneath the oil crash? How low can oil prices go? It's gotten so bad in the oil world that investment banks are practically falling over themselves to predict just how low crude will go. 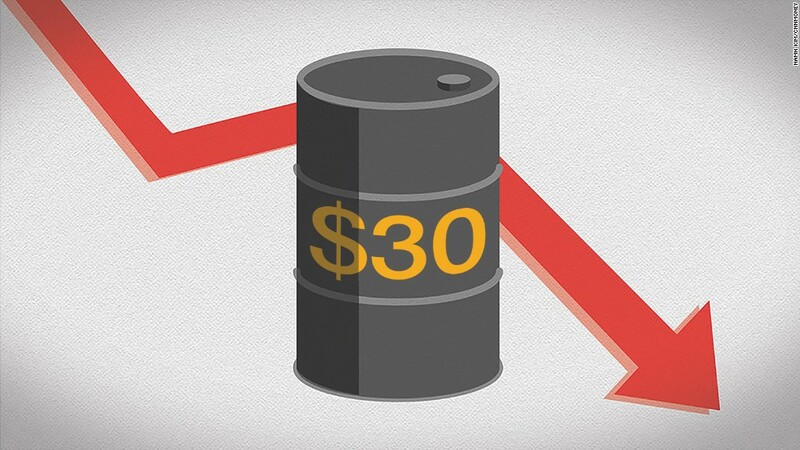 Oil prices crashed below $30 a barrel on Tuesday for the first time since December 2003. It's also a stunning 72% plunge from levels just 18 months ago. Few Wall Street firms saw the oil glut that has caused prices to collapse coming. Goldman Sachs infamously predicted in 2008 that an oil shortage would cause the commodity to skyrocket to $200 a barrel. But doom-and-gloom is all the rage now -- and price estimates keep falling. Standard Chartered doesn't think those dire predictions are dark enough. The British bank said in a new research report that oil prices could collapse to as low as $10 a barrel -- a level unseen since November 2001. To put that in context, average U.S. gas prices slipped to $1.12 a gallon back then. American drivers are already cheering a steep decline in gas prices below $2 a gallon in recent weeks. A "floor" in oil prices can only be put in once the "entire market" agrees prices have "undershot too far," Standard Chartered said. "That is likely to be a very low price," the firm said. Standard Chartered stressed that it believes the depressed prices are supported by overly negative market sentiment, not fundamentals. Crude is already cheap enough to balance the market in 2016 by causing a decline in non-OPEC supply from the U.S. and elsewhere, the firm said. "Prices are being moved almost entirely by financial flows," Standard Chartered wrote. Still, oil prices have little to fall back on these days. Not only is there an oversupply problem, but fears are rising that China's economy is slowing down more than feared. That means the country's once-insatiable energy appetite will drop. Even geopolitical flare-ups, once a guarantee to boost oil prices, aren't exciting the energy market. The recent tensions between Saudi Arabia and Iran only seemed to reinforce the idea that OPEC is far too much turmoil to agree on an output cut that would stabilize prices. "The sources of short-term support are fairly limited," Standard Chartered wrote. Despite all the doom and gloom, most observers think oil will be on the rise soon enough. The consensus call is for oil prices to rise to $50 a barrel by July. In fact, Standard Chartered is more bullish, predicting a jump to nearly $65 by then.